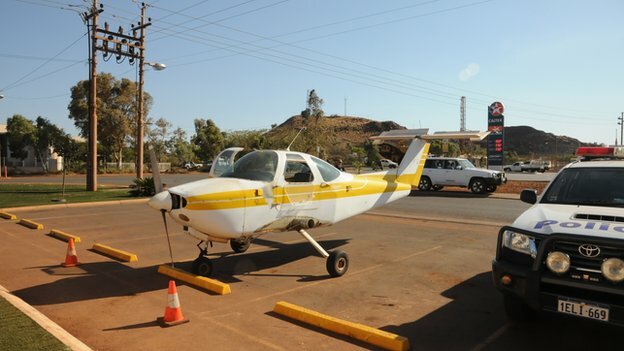 An Australian man has been charged by police after driving a light plane down the street and parking it at a pub while he went inside for a beer. Ethiopia’s historic city of Harar is one of Islam’s holiest centres – but in recent times it has built up another tradition and is now also known for its brewery. 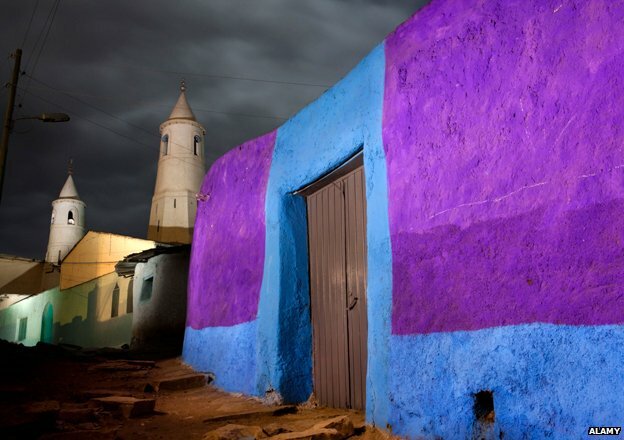 As holy cities go, Harar is a colourful one. Inside the walls of the old town I find buildings in greens, purples and yellows – its women seem to take this as a challenge, dressing in veils and robes of shocking pink and the brightest orange. 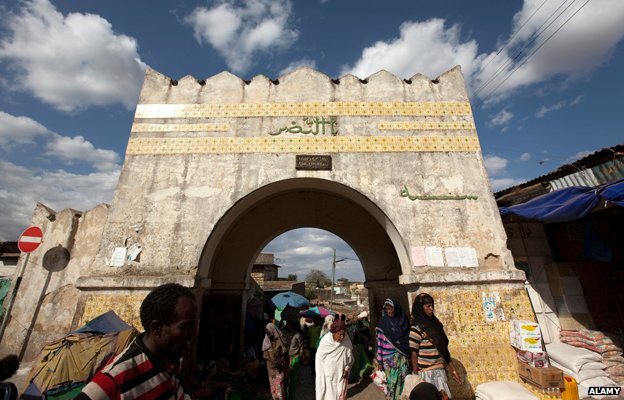 Harar lies far in the east of Ethiopia, with a road that rises out of the town in the direction of Somaliland. The mighty Muslim leader Ahmed The Left-Handed led some fierce campaigns from here in the 16th Century. On its narrow streets I meet goats, old men collapsed from chewing the narcotic khat and a young boy who stops to knock a football back and forth with me for a few minutes. Off the main square, tailors sit in front of fabric shops ready to run up alterations. Binyam, slotted behind his sewing machine, does a small tailoring job for me, recounting his Greek ancestry and the provenance of his sewing machine – a gift, he says proudly, which would cost you thousands in the local currency. He warns me off sellers of bad bananas and nearby thieves. I’ve come to find the city’s brewery, which is what it’s known for – beyond its holy credentials. 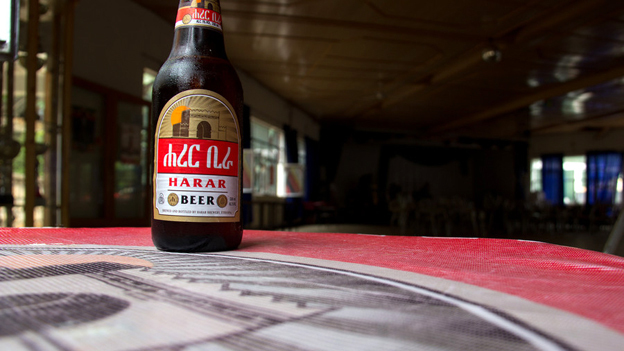 For three decades now it’s turned out Harar beer, its bottles carrying a label that depicts the old city’s famous gates. Outside these gates a tuk tuk taxi driver knows where to find the birra fabrica – the beer factory – and we set off, away from the old city, putt-putting slowly up a hill. The brewery entrance is flanked on one side by a sign prohibiting firearms and, on the other, by an enormous beer bottle – perhaps meant to remind you why you can’t bring in your gun: here be alcohol. The giant bottle is four times the height of a man. I know this because there’s a man in front of it, a security guard who’s delighted to have a visitor. He’s not quite standing to attention, but the huge beer bottle does loom behind him a little like the guardhouse of one of the Queen’s Guards in London. 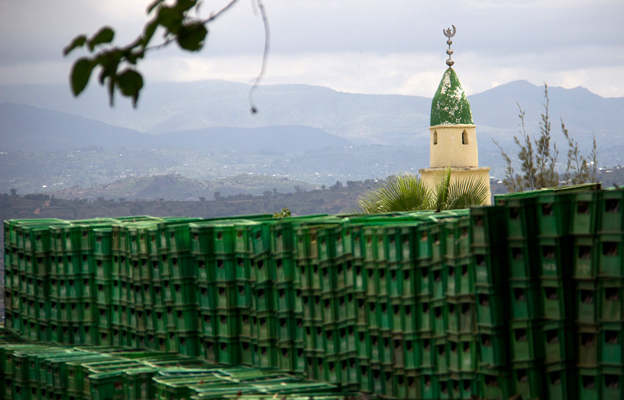 Inside the grounds, green beer crates frame the horizon, with a green mosque in the distance. Underfoot there are disused rail tracks. The net on a tennis court looks like it’s in working order though and in a rusty-looking playground a man is watching his young boy on a swing. The sleepy air around the grounds is deceptive. This brewery was sold off to the Heineken group by the government three years ago. The company says it plans to invest in the plant. It wants to improve the manufacturing processes, bring in its know-how and start sourcing more material locally, either inside Ethiopia or in the region. It’s taken over another brewery at Bedele farther west, and is building a third close to the capital. Many foreign companies point to cheap labour and helpful export tariffs as reasons for investing and the country’s just been given a grade by the credit rating agencies for the first time. Industrial parks have popped into view whenever I’ve travelled out on the arteries away from the capital, Addis Ababa. Unilever, General Electric, GlaxoSmithKline, H&M, Tesco, Walmart, Samsung – they’re all either in Ethiopia or thinking about it. The Chinese are here too, turning out thousands of shoes daily for example, just south of the capital, for major international brands. For Heineken, one of the motivations is a national market, beyond the grounds of the brewery, which can get a lot bigger – beer consumption in Ethiopia, it says, is only a third of what it is in neighbouring Kenya. In the interests of research I stop in the brewery’s clubhouse and order a beer. The women in the kitchen are amused at my intrusion. It’s a public holiday and quiet, although people are moving tables and chairs and I suspect things might get going later on. There’s a healthy-looking trophy cabinet beside my table, filled perhaps with trophies won by the brewery’s football team. It competes in Ethiopia’s premier league although it’s sitting near the bottom of the table when I visit, with relegation threatening. Back at the walls of the holy city, people in the market are oblivious to the brewery and to big business. For them the only drug worth trading is khat. 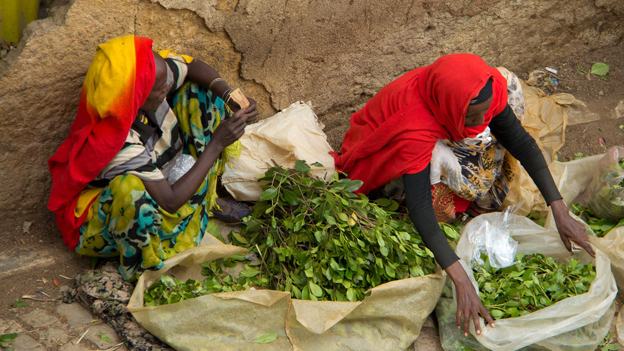 Outside my window two formidable-looking women have spread out their bags of khat leaves. A beggar, badly crippled, hauls himself over to them. Moments ago they were screaming venom at a young man – a drug deal of sorts had gone bad it seems. Now however they slip some leaves discreetly to the beggar, their way of giving alms, on the edge of the sacred town. Finnish researchers say they may be able to recreate beer from the 1840s after finding living bacteria in beer from a shipwreck near Aland Islands. 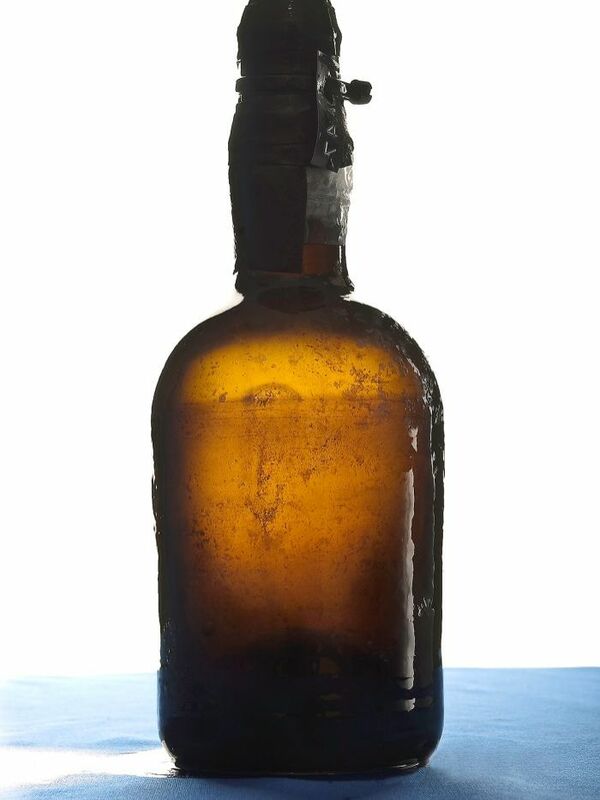 The 2010 discovery of the ship, believed to have sunk in the 1840s, also included the world’s oldest champagne considered drinkable, which has since been auctioned off. Researchers analysed two bottles of beer, which they admitted “had not stood the test of time well” but retained a pale golden colour and could originally have had hints of rose, almond and cloves. “Based on the chemical analysis we made of the beer and with help from a master brewer it would be possible to try to make beer that would resemble it as much as possible,” Annika Wilhelmson from VTT technical research centre of Finland said. The wreck lies off Aland, an autonomous part of Finland. At the time of discovery, officials said they believed the beer was the oldest in the world. “We believe these are by far the world’s oldest bottles of beer,” Rainer Juslin, a spokesman for the local government of Aaland, said in a statement on September 3, 2010. The enviable haul was found intact on the seabed at a depth of 50 metres. “The constant temperature and light levels have provided optimal conditions for storage, and the pressure in the bottles has prevented any seawater from seeping in through the corks,” the statement said. That’s not good news, that’s great news! Now maybe we’ll have a beer that is not full of chemical rubbish. Time, as we know it, could soon be in for a radical change. This week, scientists at the Royal Society are discussing whether we need to come up with a new definition of the world’s time scale: Coordinated Universal Time (UTC). And the main issue up for debate is the leap second – and whether we should abolish it. The leap second came into existence in 1972. 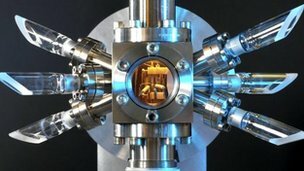 It is added to keep the time-scale based on atomic clocks in phase with the time-scale that is based on the Earth’s rotation. The reason for this is that while atomic clocks, which use the vibrations in atoms to count the seconds, are incredibly accurate, the Earth is not such a reliable time-keeper thanks to a slight wobble as it spins on its axis. Apparently while the man on the street couldn’t give a damn, these leap seconds are vitally important. Personally, I don’t mind, as long as it doesn’t interfere with the flavour of beer and coffee production.